FYF Fest 2017 is very nearly upon us. The bumper summer festival kicks off at Exposition Park this Friday and it’ll be the first three-day event in its 14 year history. This year’s lineup includes iconic artists like Missy Elliott, Björk, Frank Ocean, Nine Inch Nails, A Tribe Called Quest, Erykah Badu, Iggy Pop, Solange, Flying Lotus, and many more. Amongst the Coachella-caliber headliners, however, are a bunch of buzz bands that are likely to leave you reeling. Here’s six slightly-less-than-top-billing acts that simply can’t be missed. 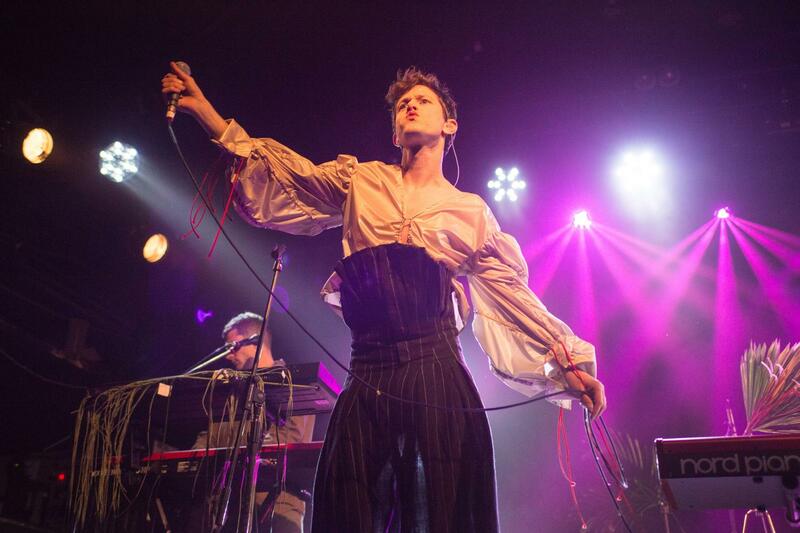 Seattle-based solo artist Mike Hadreas aka Perfume Genius makes off-beat pop-rock that’s intensely self-assured all while seemingly being filled to the brim with breathtaking fragility. The artist’s recently released album No Shape is consciously flamboyant, soul-baring and profoundly beautiful. “Moses Sumney has the kind of voice that makes the chest tighten,” wrote Pitchfork when they labeled his single “Doomed” as Best New Track. The Los Angeles-based singer and songwriter had the Most Trusted Voice in Music in awe of his stunning, bittersweet tunes. Certainly, if the swelling ambient synths don’t get you, the longing and existential questions that Sumney wrestles with sure will. Destiny Frasqueri aka Princess Nokia (FKA Wavy Spice) is a charismatic MC who grew up in New York’s Spanish Harlem. She identifies as a bruja, a tomboy, a classic New York Boricua shorty, a feminist and a queer woman, and all of those are woven into her artistry. Lovers of trap and stalwart fans of rap will know, others can find out this weekend. Australian garage band Royal Headache bring catchy, loud, fuzzy and frantic red-eyed punk-rock with them across the Pacific. The five-piece from Sydney make music that’s fast and loud and melodic, and not to be missed. Need more convincing? Washington Post just announced that on Friday night, Royal Headache was the greatest band in the world. Singer-songwriter Angel Olsen’s music ranges from dark and sprawling to lovesick folk balladry and winding psych-rock. Her recently released third album, My Woman, earned endorsements from Lorde and Bethany Cosentino of Best Coast, and reached Number 47 on the Billboard 200 album chart. Indie pop act The Drums just put out their fourth album, Abysmal Thoughts. Be sure to catch leading man Jonny Pierce writhing around like Morrisey, singing a string of violently catchy hits with an unwavering falsetto. And for those of you who snoozed on tickets, FYF will be live-streaming the festival for the first time ever, which means you can sit back and watch the mayhem from the comfort of your home.